Just for the record, today was a spectacular day. After some heavy mist this morning (not going to say the "r" word), the clouds parted and the humidity moved out. Gorgeous. I really believe the animals joined me in a big group sigh of relief. We enjoyed sunshine and a brisk breeze all afternoon. If you were a farm animal in a fur coat, you'd love this kind of day. Everything seemed to be clicking. I locked the chickens up as the sun was setting tonight, and watched the horizon turn a neon orange. All the chickens found their own ways home, and the alpacas bedded down out in the pasture, rather than in the barn, so that they could soak up the cool breeze. My sick hen continues to show a lot of improvement in her healing from the pox--the same hen I almost put down because she looked so bad. 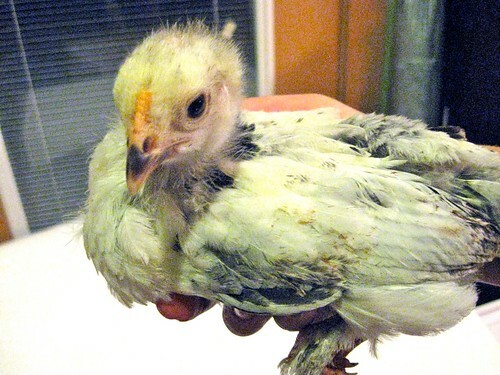 Inside, I think I've thwarted some of the suicidal tendencies of the 3-week old chicks. I made a poster board "slide" that drapes over the waterer, preventing them from jumping up on it, pooping on it, and launching from it to escape. I got the feeder raised up to a level where they don't immediately fill it with shavings and hide the feed from themselves. 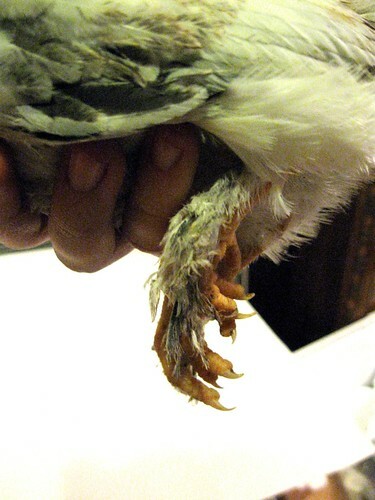 Brahmas have feathered feet! Good for cold weather. Aside from just needing a bit more room for them, I think we've got things under control for a while. I have also taken them out from under the heat lamp and have them out in the ambient air in the back room. Overnight lows are now down in the upper 40s outside, and they just aren't ready for that kind of temperature yet. A couple more weeks, and they'll go outside under the lamp again. This is a pretty docile breed, which I believe accounts for their fairly compliant dispositions so far. In the mail today, I got our local magazine, the Allen Image. Parker has the same zip code as Allen, so the post office treats us like Allenites, and we get this nice publication. 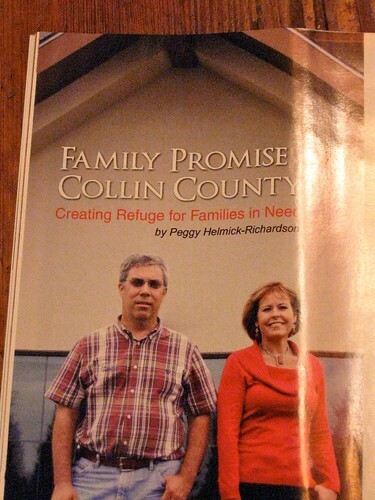 Our storyteller/shareholder Peggy Helmick-Richardson often writes cover stories for them and this issue was no exception. 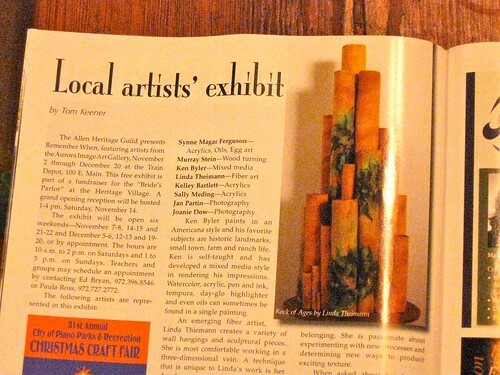 It's always fun to see her by-line, and then as I flipped through, I saw one of shareholder Linda Theiman's unmistakable felt pieces highlighted in an article on local artists! Linda will be featured with several other artists in an exhibition at the Train Depot (100 E. Main in Allen) through the Allen Heritage Guild from November 2 to December 20. It's free, so if you're in the area, think about taking it in! Linda Theiman's felt piece is highlighted. Tomorrow is the first and last Saturday in a long time that I don't have someplace to be. So I've made a nice long list of stuff to get done around the farm. And Item Number One is: sleep in. I already sleep in by most farmers' standards, but when you're a night owl like me, "late" is "later." And remember that Saturday night, Daylight Savings Time ends and we get another hour to sleep. Or knit. Oh, yeah.